The state experienced an improvement in meteorological conditions during September 2018, with some early signs of recovery in parts of coastal, eastern and central NSW. 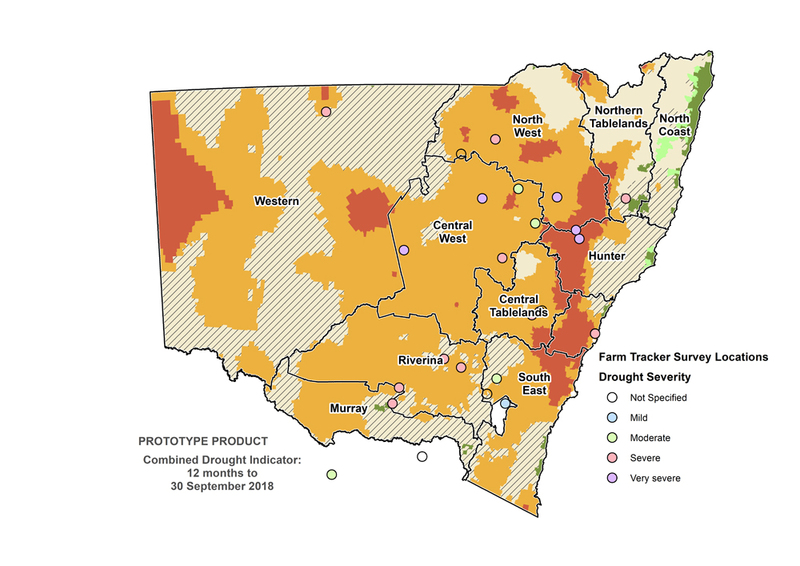 While the improved conditions are a positive sign, the drought event continues across much of NSW. This is reflected by the Combined Drought Indicator, with 98%* of the state remaining in one of the three drought categories. The latest estimates of drought intensity at the end of September place up to 38% of the state as Drought Affected, 50% in Drought and 10% in Intense Drought. Much of the North Coast is now in the Non-Drought category, with the remainder quickly transitioning out of the Drought Affected category. 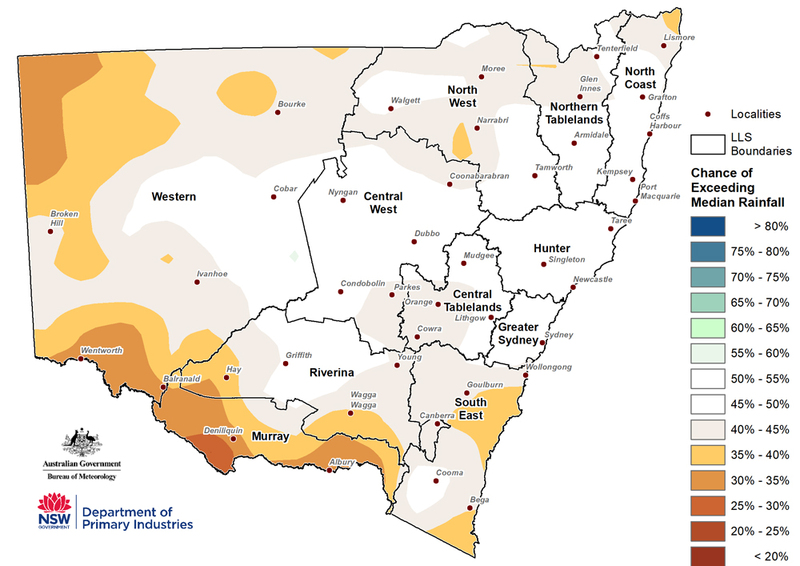 Due to the improved meteorological conditions, the amount of the state in Intense Drought has reduced over the course of September, particularly in the eastern part of the Central West, much of the Central Tablelands and parts of the Northern Tablelands, South East, Murray and Riverina Local Land Services (LLS) regions. While this is positive, it is important to recognise that these areas remain in the Drought or Drought Affected category due to continued low values in the agronomic indicators. It will take time for the improvement in meteorological conditions to be reflected in agronomic performance, and without effective follow-up rainfall, the improved meteorological conditions experienced in September may constitute a false break. The practical implication is that on-ground drought management continues unchanged for most producers in these regions. * Figures are rounded to the nearest whole number as per the standard convention. The actual figure is 98.3%. It is important to recognise the CDI provides an aggregated view of the State, and that on-ground conditions can be different to those displayed in the maps. They provide an ‘on average’ view of a particular region only. To report local conditions use DPI Farm Tracker. 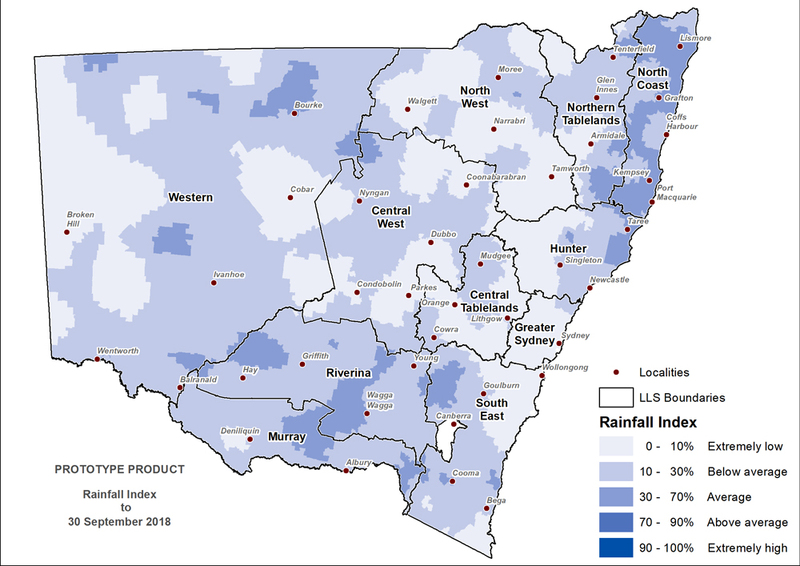 Significant rainfall of 10mm up to 50mm fell in eastern NSW in late August and early September 2018. September rainfall has generally been isolated to the coast fringe, with some reasonable falls around Newcastle and further north near Lismore. Further inland, reasonable falls were recorded near Mudgee and east of Coonabarabran. At the time of preparation of the September State Seasonal Update, widespread storms bought significant rainfall to inland NSW. On the 3-4th of October up to 50mm was recorded in the south and west of the Western LLS region. Elsewhere, falls of up to 10mm were recorded. The falls bring welcome relief to drought-affected areas across much of NSW. In the parts of the Central West and Central Tablelands regions that had early spring break, this provides follow-up rainfall and should place some areas, particularly farms in the eastern ranges, on a more certain pathway to recovery over the remainder of spring. Elsewhere, these may be the first falls of rain for some time, and while bringing welcome relief, will not significantly change drought status or affect farms currently implementing drought management. Careful monitoring over the coming weeks is required to assess the agronomic implications of the high early October rainfall event experienced in the Western LLS region. The official forecast from the Bureau of Meteorology currently indicates that there is a 50 percent chance of achieving medium rainfall over the coming forecast period (October-December), with high probability of warm conditions. This represents an improvement in the outlook for NSW, although major global climate drivers do not provide a strong signal toward wetter or drier conditions. 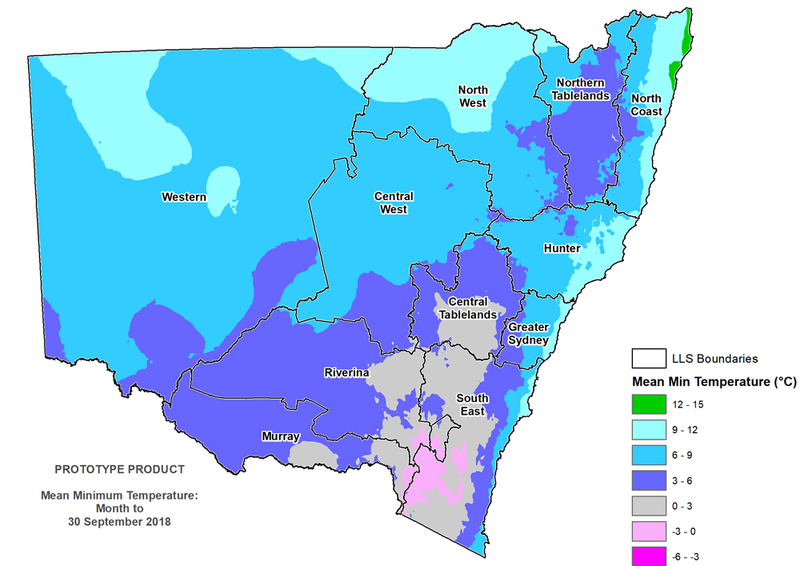 Rainfall totals (Figure 2) for September were average to very much below average across most of NSW, except for parts in the far north east regions of the state which had above average rainfall. Rainfall totals ranges from above 100mm in the east of NSW, with the highest falls along the north coast, to 0mm in the west. A significant rainfall event occurred on the 3-5th of October in NSW with substantial falls (greater than 10mm) recorded in two days across most of the state (Figure 3). Very high rainfall was recorded across a large area in the Western LLS region, south and east of Broken Hill. The data in Figure 3 provides an interim assessment of the rainfall, and a more accurate picture of the regional distribution will be possible as more station data becomes available during October. The monthly NDVI anomaly (Figure 4) indicates lower than normal greenness extended across much of NSW during September. Some areas in NSW have seen a slight improvement in the NDVI anomaly this month, a response to the rainfall during late August and September. The NDVI anomaly data confirms that plant conditions remain poor compared to what is expected at the end of winter, and that there are isolated pockets where there has been a weak-to-moderate improvement in plant growth. The majority of NSW experienced average to above average maximum temperatures during September, and generally ranged between 15-27°C (Figure 5). The alpine region recorded averaged daytime temperatures between 6-15°C. Overnight temperatures ranges between 0-12°C across the majority of NSW, with alpine regions averaging between -3-3°C (Figure 6). In the northeast of the state, overnight temperatures were generally above average, while regions in the south and west experienced colder than average overnight temperatures. No extreme events were recorded during September 2018. 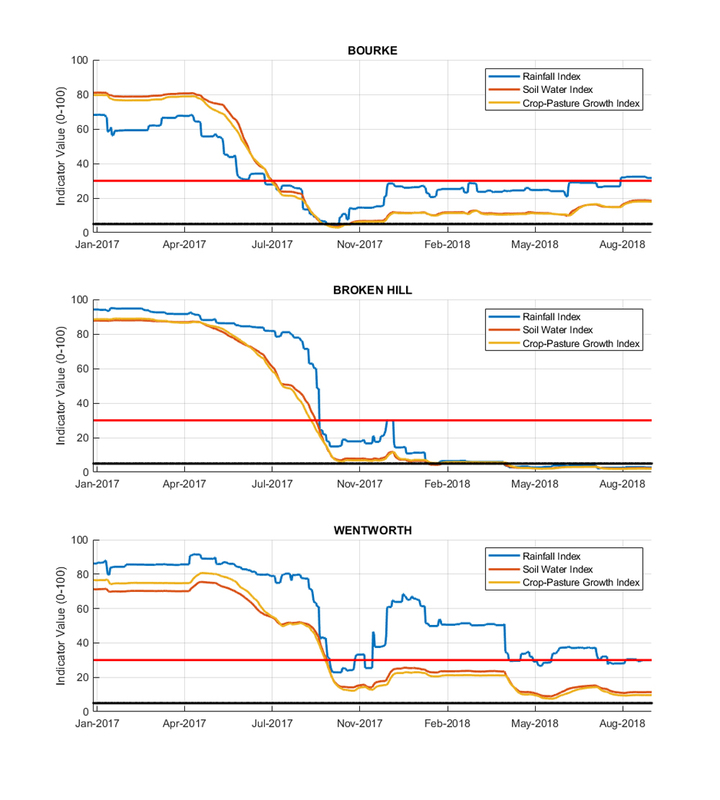 Rainfall in early September has triggered an agronomic response in parts of NSW, evident in the short term (30 day) growth rate and soil water data from the Enhanced Drought Information System (Figure 7 & 8). This is also evident in field reports highlighting an improvement in on-ground conditions, with a greening response and lift in pasture growth rates. 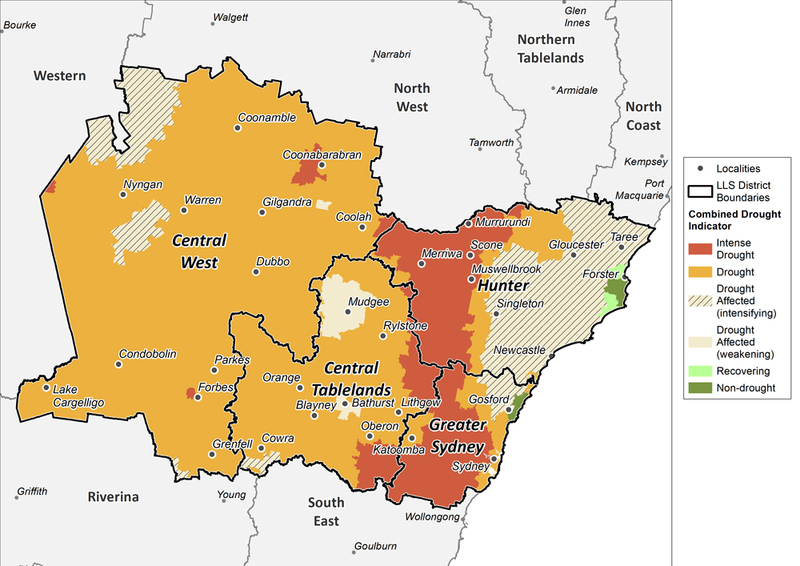 This is occurring in a belt along the south east ranges, encompassing much of the Central Tablelands, parts of the Central West, South East and Riverina LLS regions. Strong growth is also currently occurring in the North Coast and parts of the Northern Tablelands and Hunter. These maps also highlight the complex spatial variability in on-ground conditions. For example there is a gradient to the west where farms in the ‘transition zone’ such as near Coonamble, Parks and Forbes, will experience only minimal growth response, sometimes referred to as ‘green pick’ for livestock. 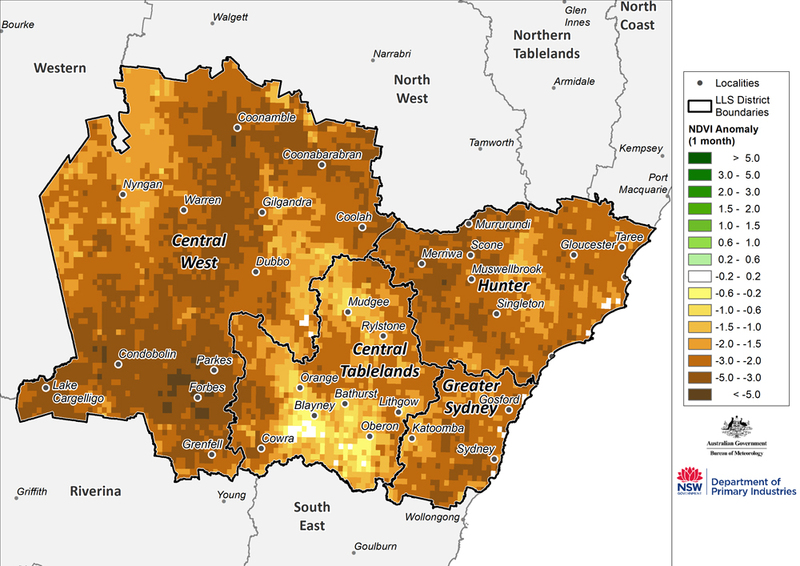 There is also a high degree of spatial variability in regions like the Northern Tablelands and Hunter, reflecting the pattern of storm rainfall interaction with the landscape. The growth and soil water maps in Figures 7 and 8 provide information about short term response only. This contrasts to the agronomic drought indicators (PGI and SWI) which factor in conditions aggregated over the last 12 months. For this reason, while the short term data tracks improvement in some regions, the drought indicators have only had minimal changes under September conditions. 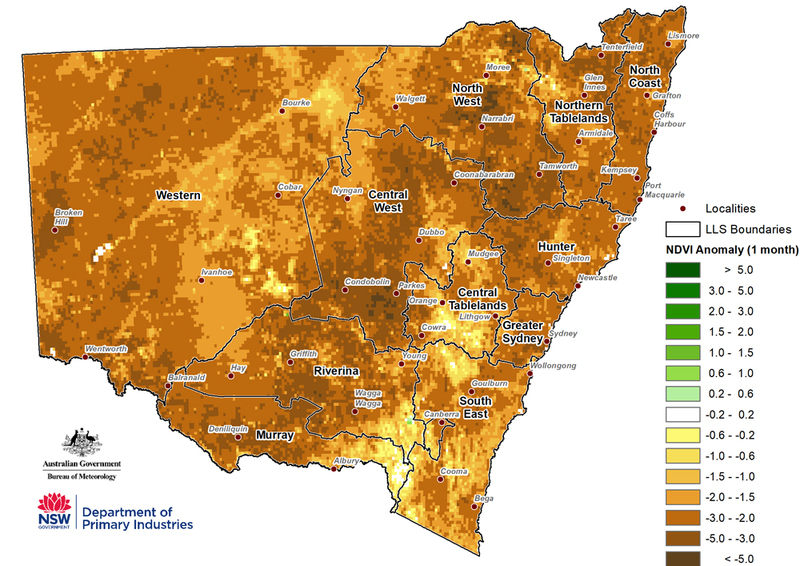 The Rainfall Index (RI, Figure 9) shows that the majority of NSW continues to be experiencing below average to extremely low rainfall. Parts of Western, Central West, Riverina Murray, South East, Hunter and North Coast Local Land Services (LLS) regions are have had average rainfall, which is an improvement from values observed over the last 6 months. 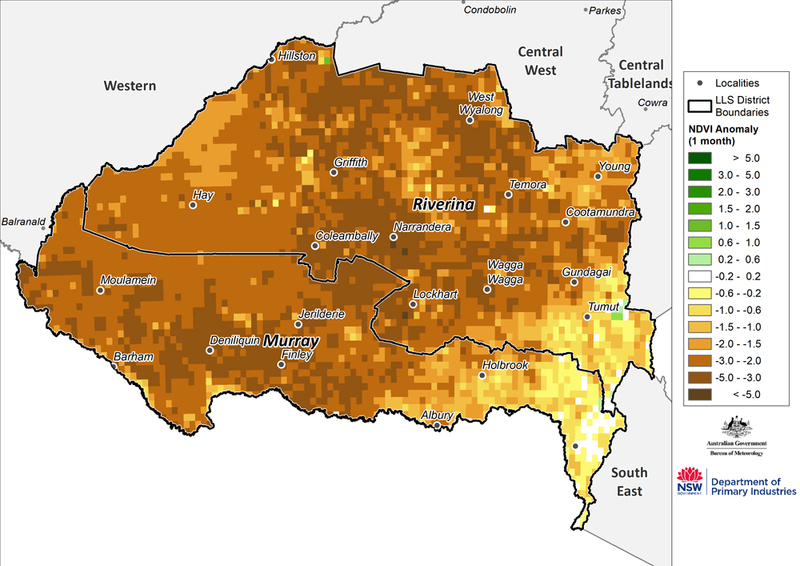 This improvement in the RI is reflected in the Combined Drought Indicator maps, especially for the coastal parts of the North Coast, near Forster in the Hunter LLS regions and Urana in the Murray LLS region. 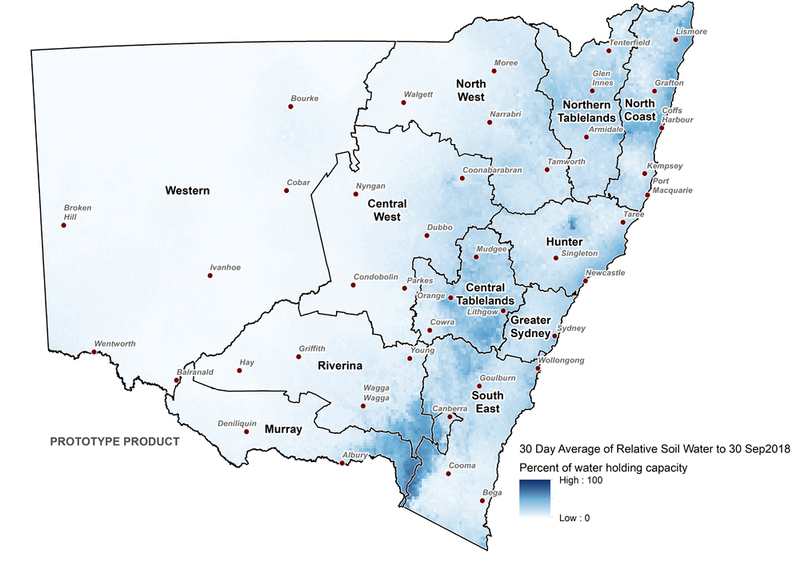 The Soil Water Index (SWI, Figure 10) shows that the majority of NSW has stored soil moisture at extremely low levels, when considering conditions over a twelve month window. Some minor improvement is evident, where the SWI is now below average to average, particularly in the coastal regions of the North Coast, in parts of the Northern Tablelands, and in the north-eastern Hunter LLS region. The Plant Growth Index (PGI, Figure 11) is still extremely low across most of NSW and largely mirrors the Soil Water Index (SWI). Some significant improvement is evident along the length of the NSW eastern coastline, where the PGI is now extremely high. The SWI and PGI are key indicators of the agronomic drought that is currently being experienced across NSW, and provide a closer estimate of visual field conditions than the Rainfall Index at this stage of the drought event. 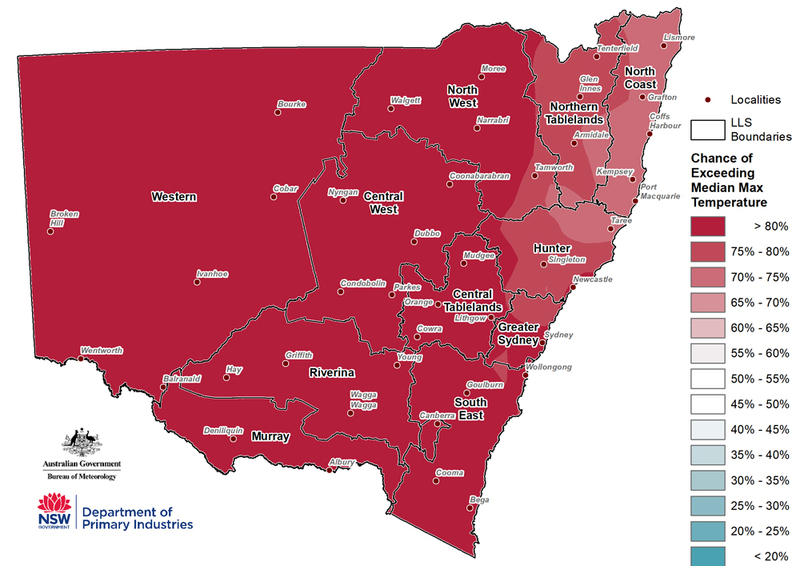 The Drought Direction Index (DDI, Figure 12) indicates that a negative trend (intensifying drought) is occurring for the majority of NSW. The area experiencing a positive trend (drought becoming less intense or improving conditions) has expanded in the central north of NSW. Changes in the individual drought indicators may have occurred since this update was released. For the most current information, please visit Drought Hub. A number of field observations have been taken by farmers and the community during September, with an even distribution across central inland NSW (Figure 13). These provide a degree of corroboration for the CDI mapping, where reports of severe and very severe drought made in the field correspond to the areas mapped in Drought and Intense Drought. The observations are made available through a new application called FarmTracker, which currently has a small user (testing) group of 60. As more users and observations become available, an in-depth verification of the drought indicators will be possible in future State Seasonal Updates. 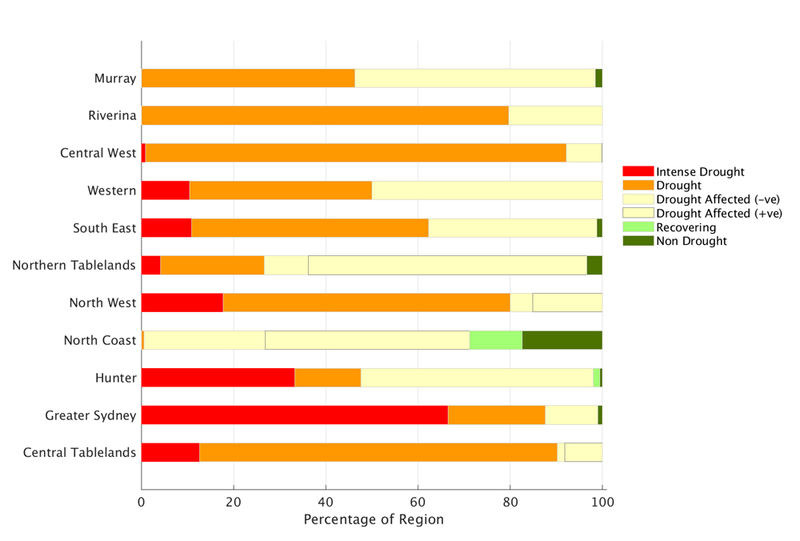 Figure 14 displays the CDI status for each individual Local Land Services region to 30 September 2018. The Murray and Riverina Local Land Services (LLS) regions experienced falls of rain between 5-50mm. The heaviest falls were located to the eastern parts of the region, with the heaviest falls in the alpine zone, whist the western parts of the LLS region missed these more substantial falls. Information from the Combined Drought Indicator (CDI; Figure 15) shows that the area in the three drought categories has remained relatively stable since the August State Seasonal Update was released, with the majority of the region remaining in either Drought, Drought Affected or Intense Drought categories. In some regions, such as areas around Urana and Khancoban, there has been some recovery over the past month and these are currently in the Non-Drought category. This has been driven by rainfall experienced in these parts during August and September. The entire region is considered to be in the Drought Affected or Drought categories. The monthly NDVI anomaly (Figure 16) data highlights a significant spatial variability experienced on the ground in the region. 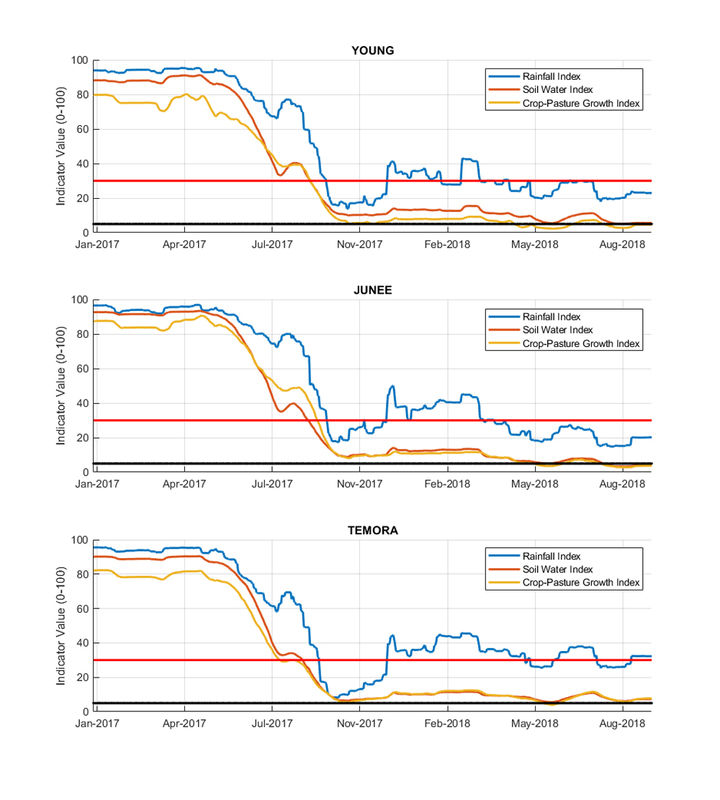 After comparing the NDVI anomaly with data from the August State Seasonal Update, it appears that regions that were showing signs of improved pasture condition in August (near Lockhart, Wagga Wagga, Temora and Cootamundra) have deteriorated during September. However there has been continued improvement in pasture conditions in the east of the regions, particularly to the east of Holbrook, Gundagai and Tumut. The Western Local Land Services (LLS) region missed the rainfall that fell in more eastern parts of New South Wales in September. Light falls were recorded, of up to 5mm, mainly in the southern and eastern parts of the LLS region. 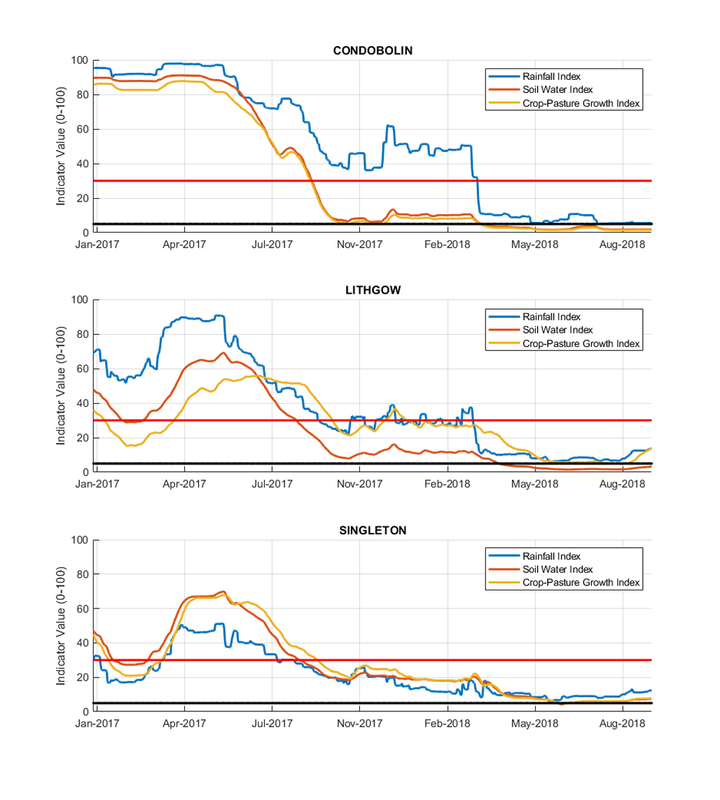 The Western Local Land Services (LLS regions) continues to experience drought conditions with no improvement in conditions over the past month (Figure 18). Areas currently in the Intense Drought category include the region from Broken Hill north to Tibooburra, south of Menindee, the greater Cobar region and to the north of Euabalong. The Combined Drought Indicator classifies the remaining parts of Western LLS region as either in Drought or Drought Affected. The monthly NDVI anomaly (Figure 19) data highlights a significant spatial variability experienced on the ground in the Western LLS region. It confirms high levels of plant stress in the Broken Hill and Cobar regions. It also suggests that there are similar conditions in the area south of Menindee to Balranald and Wentworth. 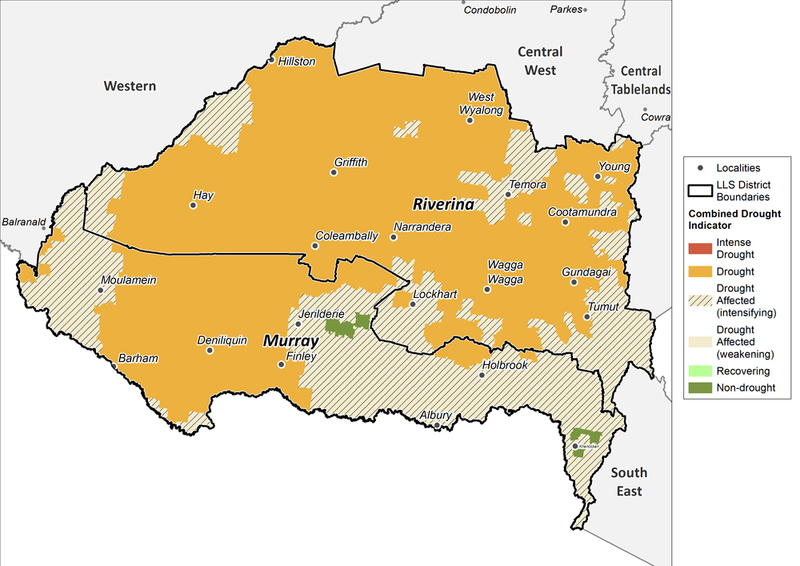 There are areas in the Western LLS region where significant improvement in plant condition is evident, particularly the area around Brewarrina, and to the east of Ivanhoe. Slight improvement in plant condition is observed along the Darling River. It is important to note the complex interaction between rainfall, total grazing pressure and deficiencies in the climate monitoring network in this region. As noted in previous reports, DPI takes a conservative approach to the classification of drought in this region to account for these factors. The Northern Tablelands and North Coast Local Land Services (LLS) region generally experienced falls of between 25-100mm during September, Some isolated heavier falls were recorded around Ballina and inland from Coffs Harbour, where falls of above 100mm were recorded. The eastern part of the North West LLS region recorded falls above 10mm, however the western parts of these LLS regions received falls of less than 10mm. Information from the Combined Drought Indicator (CDI; Figure 21) shows that the area in the three drought categories has remained relatively stable since the August State Seasonal Update was released, with the majority of the region remaining in either Drought, Drought Affected or Intense Drought categories. 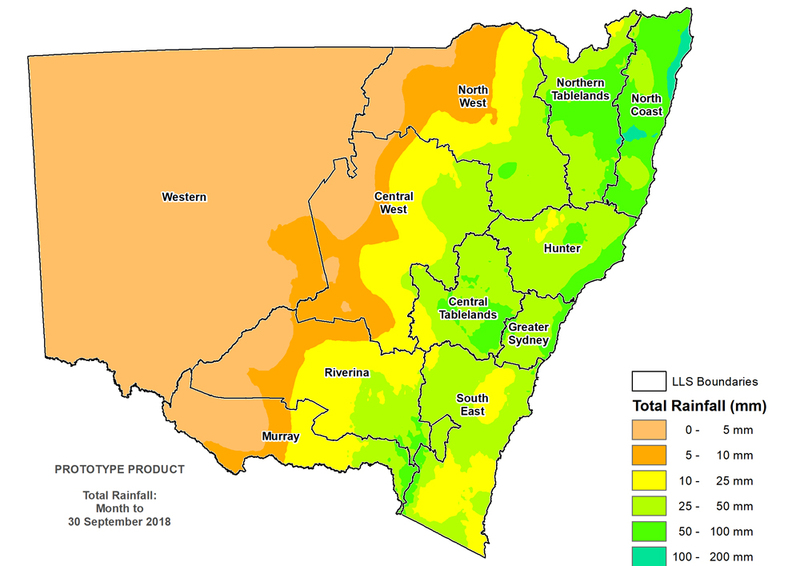 In some regions, such as areas around Walgett and to the north of Armidale, there has been some improvement in conditions over the past month, where the areas in Intense Drought have retracted into the Drought category. This has been driven by rainfall experienced in these parts during August and September. 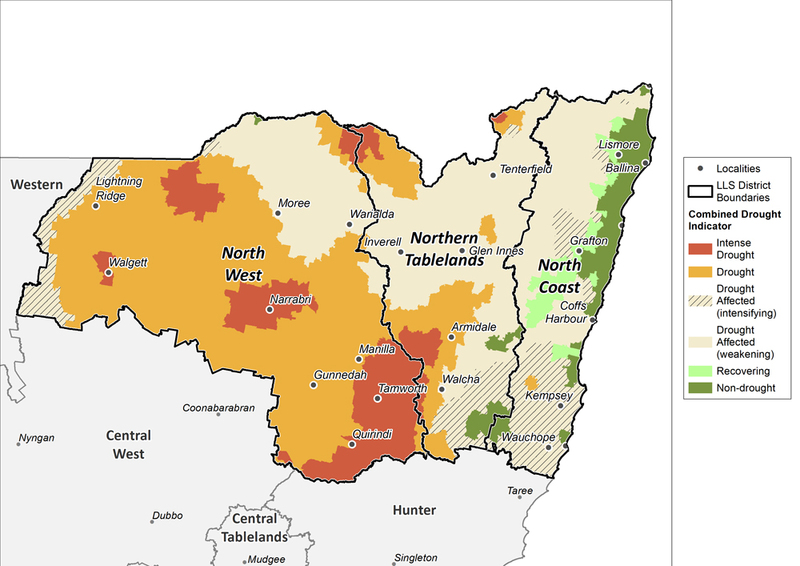 The region around Tenterfield and south of Boggabilla has also seen some improvement and is now positioned in the Drought Affected category. However without follow-up rain in the coming weeks, these regions could transition back into the Drought category. There have been signs of recovery in the North Coast LLS regions with parts along the coastal fringe now entering the Non-Drought Category. 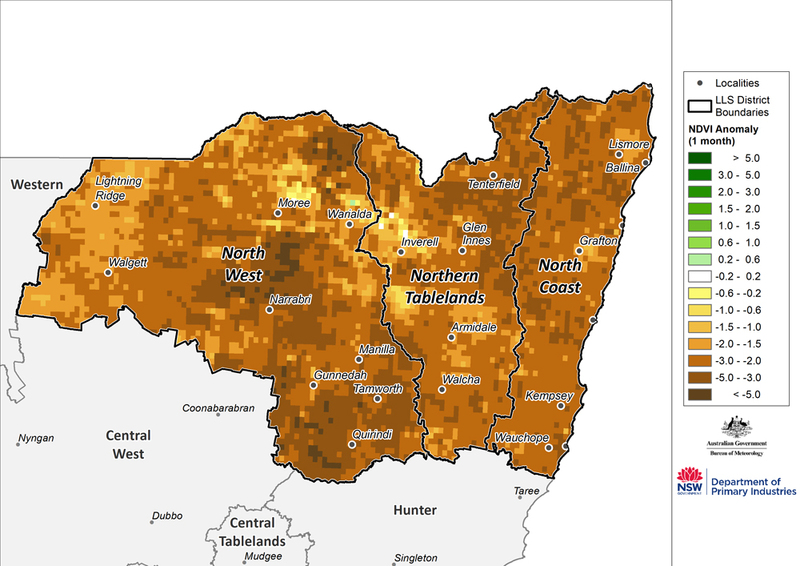 Part of the Northern Tablelands LLS region, to the east of Wollomombi and north east of Nowendoc, is also currently in the Non-Drought category. With continued follow-up rain, recovery in these areas will strengthen over the next month. The NDVI anomaly data (Figure 22) reflects both the high degree of spatial variability in the pasture base, as well as the relative response of regions to the rainfall deficit. 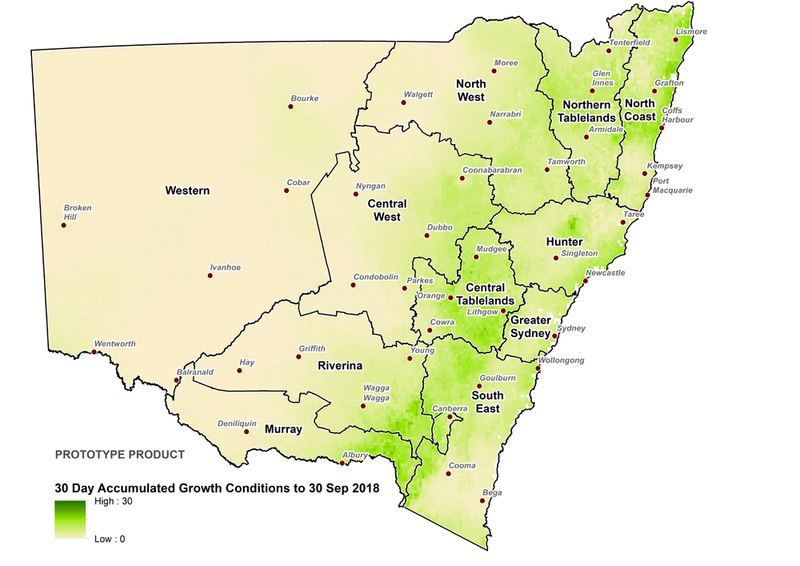 There are also isolated pockets across the North West and Northern Tablelands LLS regions where there has been weak-to-moderate improvement in plant growth. 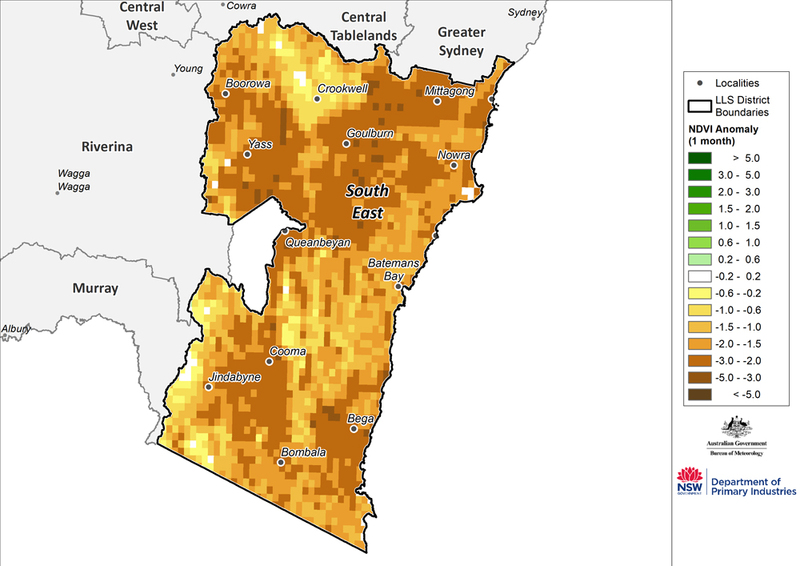 The Central Tablelands, Hunter and Greater Sydney Local Land Services (LLS) regions generally experienced falls of between 25-100mm during September, with the heaviest falls being recorded along the coast and inland around Orange, Oberon, Lithgow and Mudgee. The eastern part of the Central West LLS region recorded falls above 10mm, however the western parts of this LLS regions received falls of less than 10mm. Information from the Combined Drought Indicator (CDI; Figure 24) shows that the areas in the three drought categories in both the Hunter and Greater Sydney LLS regions has remained relatively stable since the August State Seasonal Update was released, with the entire region remaining in either Drought, Drought Affected or Intense Drought categories. 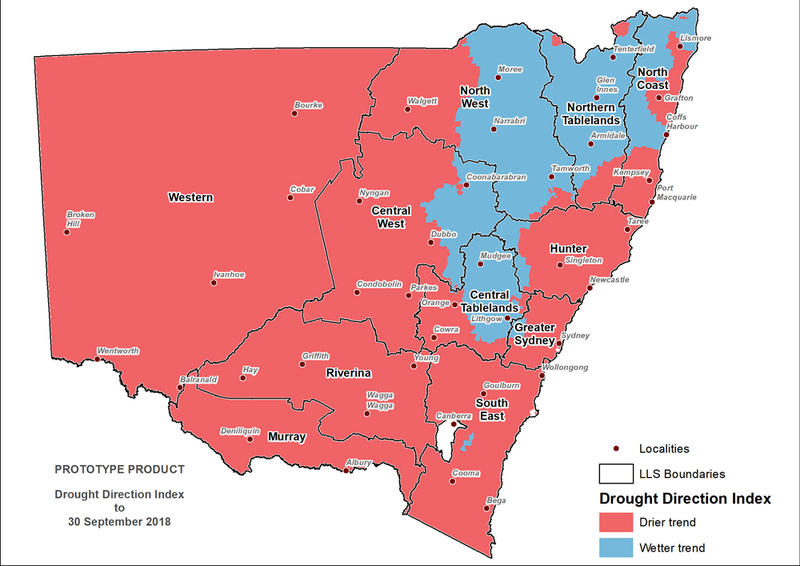 The Central Tablelands and Central West LLS regions has seen some improvement in conditions over the past month, where the areas in Intense Drought have retracted into the Drought category, particularly around Parkes, Forbes, Coonamble, Wellington and to the east of Coonabarabran. This has been driven by rainfall experienced in these parts during August and September. The NDVI anomaly data (Figure 25) reflects both the high degree of spatial variability in the pasture base, as well as the relative response of regions to the rainfall deficit. 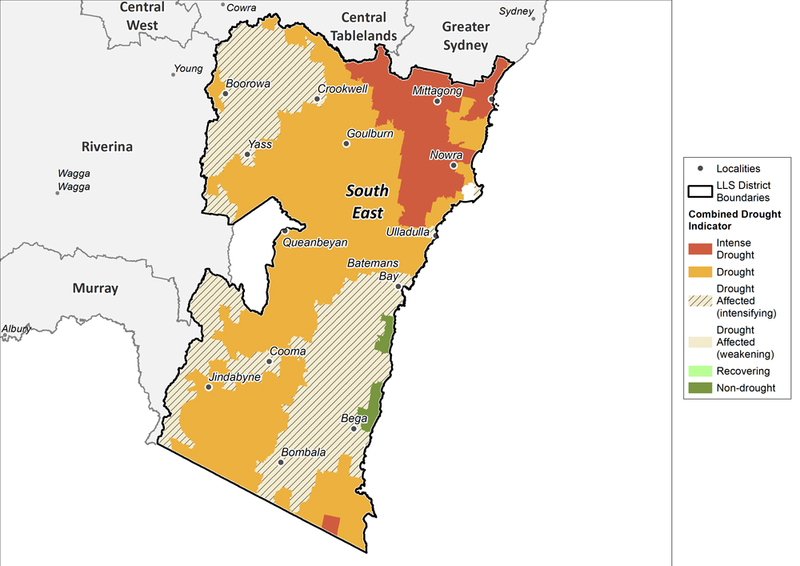 There are also isolated pockets across the Central Tablelands and Central West LLS regions where there has been weak-to-moderate improvement in plant growth. The South East Local Land Services (LLS) region generally experienced falls of between 10-50mm during September. Information from the Combined Drought Indicator (CDI; Figure 27) shows that the areas in the three drought categories has remained relatively stable since the August State Seasonal Update was released, with the entire region remaining in either Drought, Drought Affected or Intense Drought categories. A small section of the coastal fringe between Bega and Batemans Bay has had significant recovery and is currently classified as Non-Drought. These improved conditions were observed in the previous report, but due to monitoring framework and underlying meteorological data not accurately capturing coastal climatic conditions, this region was still registering as Drought Affected in August. The NDVI anomaly data (Figure 28) reflects both the high degree of spatial variability in the pasture base, as well as the relative response of region to the rainfall deficit. The NDVI deficit in many parts of the South East region is closer to average conditions for the current time of year than during the previous month’s report. Regions still experiencing below average NDVI anomalies include areas near Bega, Cooma, Goulburn, and Mittagong. The official national climate outlook for October to December was issued by the Bureau of Meteorology on 27 September 2018. The outlook shows that parts of eastern and southern Australia are likely to be drier than average over the next three months, including parts of Queensland, eastern South Australia, Tasmania, Victoria, southern and Western New South Wales, southwest Western Australia and parts of the Northern Territory. October to December daytime temperature have an increased likelihood of being warmer than average across most of Australia. Overnight temperature also have an increased likelihood of being warmer than average across Australia, except for the northeast Northern Territory and the northern to central coast of Queensland which have a near equal chance of cooler or warmer overnight temperatures. For New South Wales, the rainfall outlook (Figure 30) for October to December indicates that there is a near equal chance (40-60% probability) of wetter or drier than average conditions across the next three months. 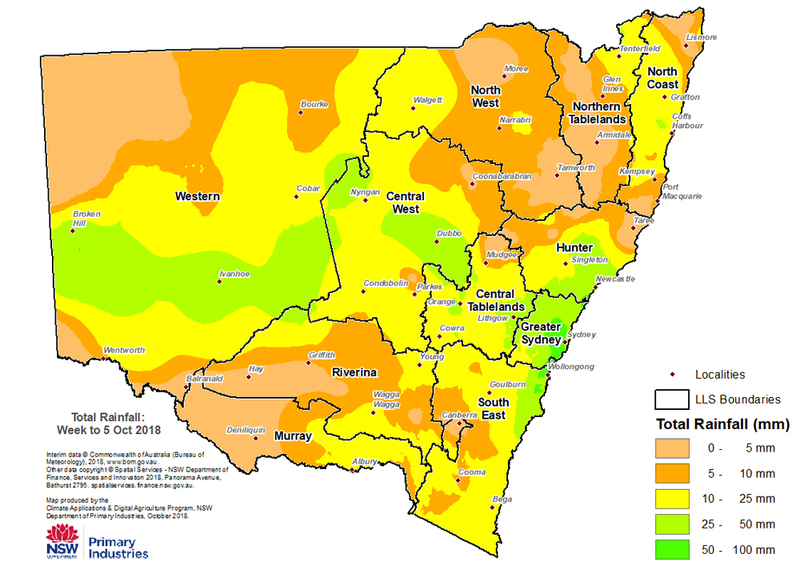 The exceptions are parts of western and southern NSW which has an increased chance of drier than normal conditions. 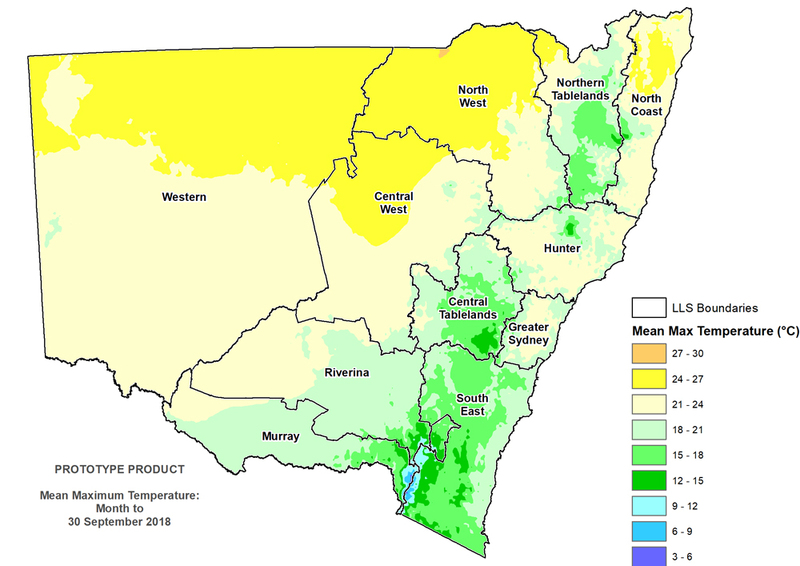 This represents an improved outlook for NSW where the forecast for the previous period (September to November) had much of NSW having a low (25% or less) chance of achieving medium rainfall over the three months. The forecast maps in Figures 30-32 are based on a new forecasting system released by the BoM in September 2018, called ACCESS-S. This provides an improved spatial resolution in forecasting across the state, as well as improvements in the underlying circulation models and data assimilation scheme. As of 9 October 2018, the Bureau of Meteorology’s has raised its ENSO Outlook to El Niño Alert, with a 70% chance of El Niño forming in 2018. . Four of eight models predict El Niño thresholds will likely be exceeded in the coming months, with another two falling just short. 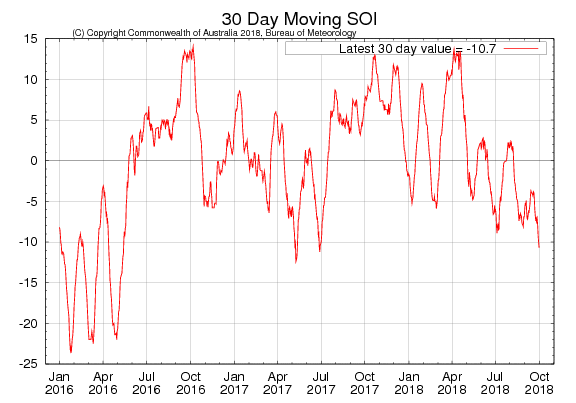 The 30-day SOI value (Figure 33) is currently weakly negative (30 day value was -6.7, 90-day value was -4.4 as of 23 September 2018) and has remained so since mid to late August. Cloud levels at the junction of the equator and the International Date Line fluctuated around average during September and have generally been below average since February. Whilst below average cloud levels is usually indicative of La Niño, the overall pattern of cloud levels across the Pacific has been more consistent with a neutral ENSO. Trade winds are currently slightly weaker than average across the tropical Pacific (west of the International Date Line) and close to average across central and eastern tropical Pacific (as of 23 September 2018). Generally during an El Niño there is a sustained weakening of trade winds across much of the tropical Pacific. Monthly sea surface temperatures anomalies (SST) for September (Figure 34) were slightly warmer than average in the tropical Pacific, but still within the neutral range for ENSO. Anomalously warm sea surface temperatures are affecting parts of the South and North Pacific. Sub-surface temperatures (Figure 35) shows a pool of anomalously warm water in the equatorial Pacific. 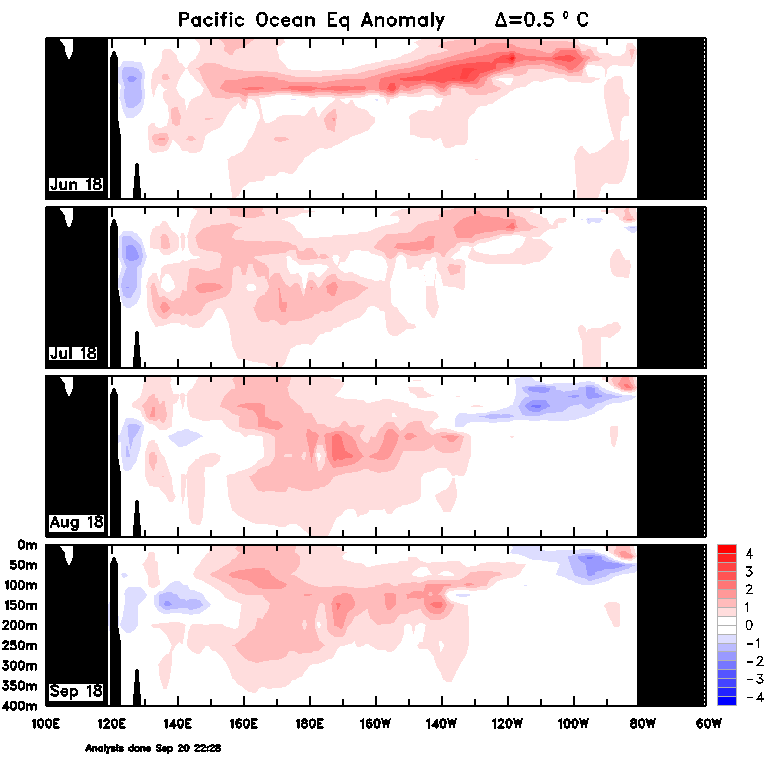 A pool of slightly cooler than average water is also present in the shallow sub-surface of the eastern equatorial Pacific, although the extent of this has decreased since August. Overall conditions are consistent with a neutral ENSO. The Indian Ocean Dipole (IOD) remains neutral (as of 25 September 2018). The index climbed during September, and have now been above +0.8°C for two weeks. Four of the six international climate models surveyed by the Bureau of Meteorology predict that the index will remain positive into October, indicating that this may be the start of a positive IOD event. However it would take several more weeks of positive values (above thresholds) for a positive IOD to be considered established. Five out of the six models suggest that values will be neutral by December 2018. A positive IOD typically reduces the amount of spring rainfall in central and southern Australia. The Southern Annular Mode (SAM) is currently near neutral (as at 20 September 2018). The outlook is for SAM to remain neutral to weakly positive into mid-October. Much of the information in the Seasonal Conditions Report is sourced from the NSW DPI Enhanced Drought Information System (EDIS) ™. The EDIS system is currently available in prototype form and is subject to an intensive ground truthing process. For more information, visit the interactive website via Drought Hub. It tracks drought by using four indicators; rainfall, soil water, plant growth, as well as tracing rainfall trends. Agronomic conditions have equal value to rainfall recorded at meteorological stations. The Combined Drought Indicator (CDI) brings this information together, and has been designed to characterise developing drought conditions. The key purpose for building the CDI was as a drought early warning system. 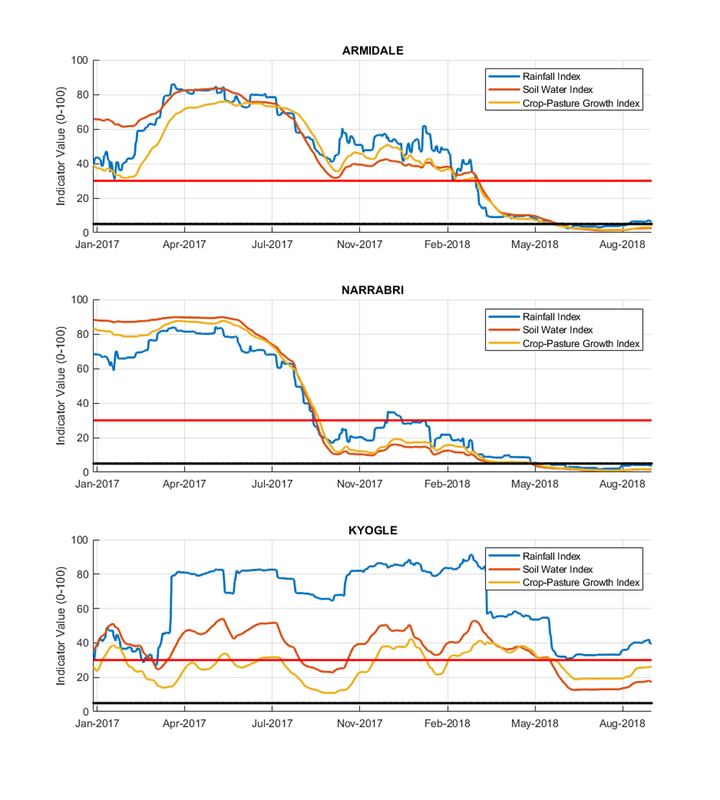 The rainfall, soil moisture and plant growth indicators in EDIS account for conditions over a 12 month window. This provides a compromise between a highly sensitive indicator (e.g. six months) and a less sensitive indicator (e.g. 24 months). Climate and remote sensing data drive the information system at a high resolution, but the CDI is reported at a Parish level. Because of its configuration and purpose, there will be differences to the indicator used in the National Drought Monitoring Framework (the Australian Rainfall Deficiency Analyser) which relies on rainfall alone. 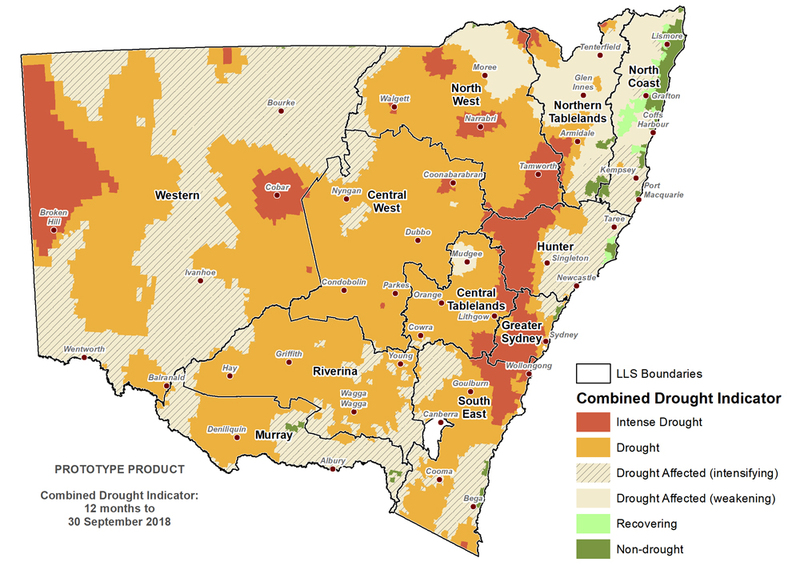 The CDI has three drought categories that characterise NSW according to drought intensity as well as the main drivers of a drought event (meteorological, hydrological and agronomic). DPI considers areas Drought Affected to be experiencing a drought event. The Drought Affected category encompasses a wide range of conditions from the very early stages of drought entry through to a drought event becoming intense. This enables the drought monitoring system to detect a drought event early. It is also possible to stay in the Drought Affected category for some period of time. The way in which the indicators are combined to form the CDI is described in Table 2 below. Ground cover is very low, soil moisture stores are exhausted and rainfall has been minimal over the past 6-12 months. Conditions may be very dry, or agronomic production is tight (low soil moisture or plant growth). It is possible to be in Drought when there has been some modest growth, or a few falls of rain. At least one indicator is below the 30th percentile and the rainfall trend is negative over the past 90 days. Conditions are deteriorating; production is beginning to get tighter. Ground cover may be modest, but growth is moderate to low for the time of year. When indicators are close to the Drought threshold drought conditions are severe. At least one indicator is below the 30th percentile and the rainfall trend is positive over the past 90 days. Production conditions are getting tighter, but there have been some falls of rain over the past month. It is rare to enter the Recovering phase from the Non-Drought category; Usually there is a quick (1-2 week) transition into Drought Affected or Drought. When indicators are close to the Drought threshold drought conditions are severe. Production is occurring but would be considered ‘below average’. Full production recovery may not have occurred if this area has experienced drought conditions over the past six months. At least one indicator is above the 50th percentile. Production is not limited by climatic conditions. 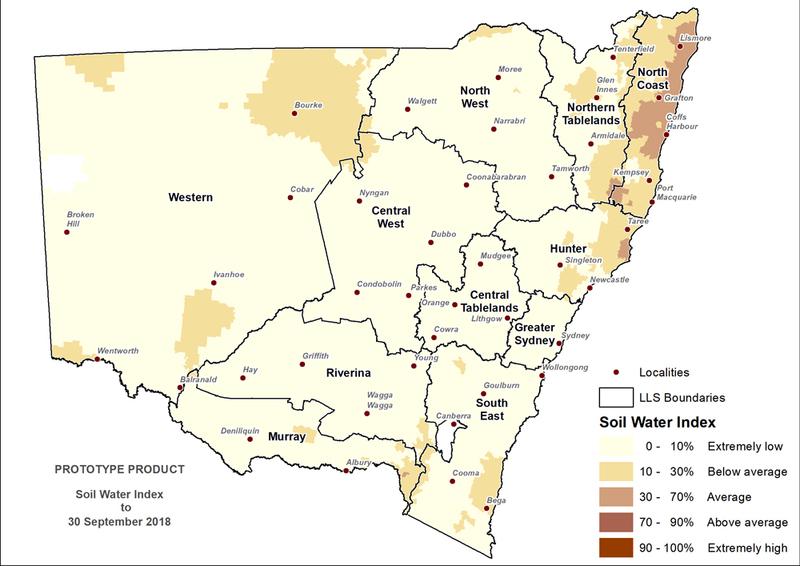 The NSW State Seasonal Update is provided each month by the NSW DPI Climate Unit, which is part of the Livestock Systems Branch in DPI Agriculture. Information used in this report was primarily sourced from the Australian Bureau of Meteorology, the US National Oceanic and Atmospheric Administration, the International Research Institute for Climate and Society (Columbia University) and NSW Department of Primary Industries. Maps in this document contain data which is © Spatial Services – NSW Department of Finance, Services and Innovation (2018), Panorama Avenue, Bathurst 2795 and data which is © Commonwealth of Australia 2018, Australian Bureau of Meteorology, Melbourne. All rights reserved. The seasonal outlooks presented in this report are obtained from the Australian Bureau of Meteorology and other sources (including World Meteorological Organisation Global Producing Centres). These outlooks are general statements about the likelihood (chance) of (for example) exceeding the median rainfall or minimum or maximum temperatures. Such probability outlooks should not be used as categorical or definitive forecasts, but should be regarded as tools to assist in risk management and decision making. Changes in seasonal outlooks may have occurred since this report was released. Outlook information was up to date as at 3 September 2018. 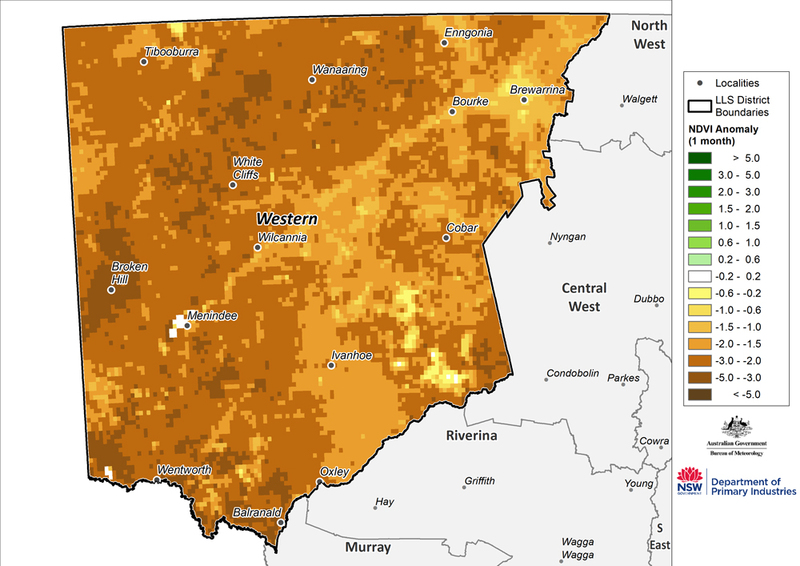 All climate and remote sensing input data is supplied to the Enhanced Drought Information System ™ under the Australian Creative Commons Licence (CCY 4.0) and is made available by the Terrestrial Ecosystem Research Network. © State of New South Wales through the Department of Industry, Skills and Regional Development, 2018. You may copy, distribute and otherwise freely deal with this publication for any purpose, provided that you attribute the NSW Department of Primary Industries as the owner. Disclaimer: The information contained in this publication is based on knowledge and understanding at the time of writing (October 2018). However, because of advances in knowledge, users are reminded of the need to ensure that information upon which they rely is up to date and to check currency of the information with the appropriate officer of the Department of Primary Industries or the user’s independent adviser.